All dogs throw up from time to time. They eat something they shouldn’t and BLECH, out it comes right back into the world, almost always on the rug. But what if the vomiting isn’t one and done? Should you worry or is your dog just doing a normal doggie thing? Gastritis may actually be to blame. Gastritis is inflammation of the walls of the stomach. The redness and swelling in the stomach can be acute and last for about 24 hours before resolving on its own. Chronic gastritis lasts for longer periods of time, from weeks to months and could be associated with an underlying, potentially serious condition. 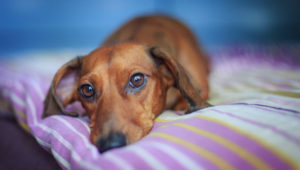 Gastritis in dogs looks very similar to food poisoning in humans. Your poor little pup may become suddenly and violently ill from one or both ends. Lack of appetite, lethargy, depression, and increased thirst are common. Stools may look like tar or contain blood. Your pup may hunch her back due to abdominal pain. Our curious fur babies are quite adventurous when it comes to food choices. They will sample just about anything that smells interesting including but not limited to rotten food, garbage, and toxic plants. Further, dogs are not very keen on dietary regulation. If given the opportunity, they will happily eat their way to the bottom of that bag of kibble until they almost burst. These periods of ingestion indiscretion lead to acute gastritis and will resolve on their own, much like that dreaded stomach bug your preschooler carted home on his insufficiently washed hands. Chronic gastritis is trickier. If your dog’s symptoms do not resolve in about a day a trip to the vet is warranted. Your vet may do blood work or an x-ray along with an exam to try to pinpoint what is causing his tummy trouble. Most of the time, your pup has simply gotten into something she shouldn’t have and will be completely fine after her body has ejected what ails her. If you’ve ever had a stomach bug you can empathize with your pup’s condition. Just like you would, she may feel weak, tired, and uninterested in food even after the vomiting has stopped. With time and some TLC, she will be back to her normal spunky self. Outcomes with chronic gastritis will depend largely on the root cause. Your vet will be able to provide a diagnosis and prognosis based on the findings. What has your pup eaten in the last few days? Has she been alone with access to the trash, yard, etc? Is she taking any new medications or supplements? Has she been near any chemicals, cleaners, pesticides, etc? Does she tend to eat toys, tools, or other non-food items? Does she has a history of vomiting or other gastro problems? Has she been around any new animals? Is there an existing or past serious illness in her medical history? What does her stool look like? In addition to questions such as these, your vet will give your dog a thorough physical exam. She will be searching for signs of abdominal pain, tenderness, swelling, gas, bloat, fever, and dehydration. 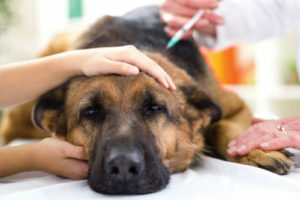 The vet may order some tests including blood and/or urinary analysis, abdominal x-rays, or ultrasound to look for blockages, growths, or foreign objects. 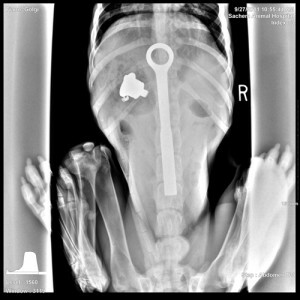 A 1-year-old mastiff swallowed an 8-inch ratchet which made him very sick. The object was removed and the dog recovered and his condition improved. Dehydration from continuous vomiting and the inability to keep fluids down will be treated with IV fluids. This will improve your dog’s well being greatly and put her on the road to recovery. Anti-emetics are prescription drugs that stop vomiting and may be prescribed if your vet thinks it is warranted. Anti-emetics come with the potential for side effects such as behavioral changes, drowsiness, dizziness, and constipation. Your vet will advise you on these and any other potential side effects. During recovery, your vet may instruct you to withhold or restrict food and water intake. Food and water will be slowly and thoughtfully introduced while your pup’s tummy heals. An ounce of prevention is worth a pound of cure. Keeping your dog current on parasite preventatives and providing stool samples to your vet at wellness checks are both important steps to take in keeping your dog healthy. If you have a dog who loves dumpster diving, do everything you can to keep that snout away from your household garbage. If you live in an area with wildlife, keep your yard clean of any waste from these animals to avoid a curious ingestion incident. There is nothing worse than seeing your beloved fur baby so sick that they can’t even eat. 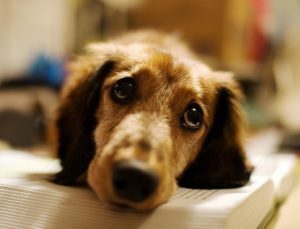 If your pup gets gastritis, we hope that you and your loved one will be on the mend soon.